The state Senate&apos;s minority leader says the state needs to cut spending, but says that&apos;s unlikely now that Democrats control both chambers of the legislature and the governor&apos;s office. Wisconsin is officially in a recession, and Senate GOP leader Scott Fitzgerald thinks that ought to put an end to talk of tax or revenue increases. 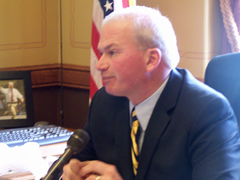 "You&apos;d think that would put he brakes on those proposals," Fitzgerald said prior to Monday&apos;s official opening of the 2009-2010 session of the Wisconsin Legislature. "I&apos;m still very concerned (PDF) about what I&apos;m hearing, both from the governor&apos;s office and the Democratic caucus in the state Senate right now." Fitzgerald expects Democrats will attempt to bridge the state&apos;s deficit gap with the hospital tax, oil franchise fee, tax hikes on cigarettes and beer and expanded sales taxes. None of those things, Fitzgerald said, will address the real issue: jobs. "There&apos;s no way to increase jobs by increasing the revenue stream," he said. Still, Fitzgerald does not expect entirely smooth sailing between the Democratic governor and members of his party in the legislature. Fitzgerald predicts Democrats will once again introduce their Healthy Wisconsin plan, a health care initiative which Doyle oppose last year, in favor of his own BadgerCare Plus plan. "They&apos;re gonna run this back up the flagpole," Fitzgerald predicts. "It&apos;s going to be a difficult issue for the Democrats themselves to work through, but I expect that it will be back." Fitzgerald doesn&apos;t expect his members will be consulted on much in this new session. "But we&apos;re more than willing to work with them," he added. "If it doesn&apos;t happen, one of the things we&apos;ll do is demonstrate what the Republicans think would be the best move right now for the state of Wisconsin, and what the Democrats are doing."